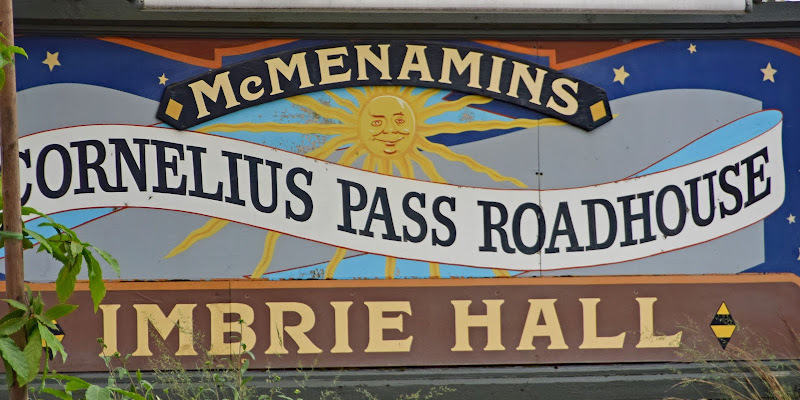 During our second tour day of the American Peony Society annual convention, almost two weeks ago now, we dined at McMenamins Cornelious Pass Roadhouse in Hillsboro, Oregon for lunch. The food was delicious and very fresh! We dined on make your own tacos or nachos with all of the toppings - sauteed beef or chicken with peppers and onions, rice, beans, cheeses, salsa, guacamole, pico de gallo, and sour cream. Since our group was so large, we had a large party tent and several tables set up right behind it in the grass too. I ate outside the tent in the garden, and it was the perfect day to do so. The food was delicious, and there were several drink selections as well. They had a bar set up inside the tent where you could purchase local Oregon-made brews and wines to go with your meal. There was also lemonade, water and tea set up for self service. All of the APS Members seemed to enjoy themselves at the lunch in the beautiful surroundings. I just wished I'd had a little bit more time to explore the gardens and the historic farmhouse from the 1840s on the property, which is now known as Imbrie Hall (named after the original owners of the property). Apparently the McMenamins like to purchase historic properties and turn them into dining and event venues. It is their way of helping to preserve them for future generations and making them available for the community's enjoyment - what a novel idea. After lunch Lore, the 2018 APS Convention Chair, talked with everyone about the Portland Rose Garden and options for exploring the other connecting Portland parks if you wanted to stay at the park longer than the tour buses would be there. All in all McMenamins provided a nice respite and a tasty lunch!